One of the most fascinating craft breweries in the UK can be found nestled in a series of arches beneath a railway bridge in Bermondsey in London. For the last 9 years, The Kernel, under the guidance of its founder Evin O’Riordan, have pioneered not just amazing and distinctive beers, but also an approach rooted in connection to place, to a different way of doing business. Before The Kernel, Evin worked for Neal’s Yard Dairy, selling cheese. One day in 2007 he was sent to New York to help the organic supermarket Whole Foods to set up a cheese room, and then one evening he was taken to a bar with 40 taps, each with a different beer. In the same way that he knew the story of every cheese he sold, the farm, the sheep, the feed, the grass – the barman could say “this beer is made to this recipe, for this reason, by this man, and these are the hops he uses.” As he told me, “my thought processes already could follow that line of thinking, but I’d never had anything to fill in those beer gaps before”. He came back to London looking for the same thing here, but apart from a few early pioneers, there wasn’t much to be found. He tried buying imports of the beers he had loved in New York, only to find the freshness he had so admired was much diminished by long distance travel. As a result, as he told me, “our focus now is very much on things local. I get asked a lot to send beer to the States. No, not even for a festival. Not even for a one off”. 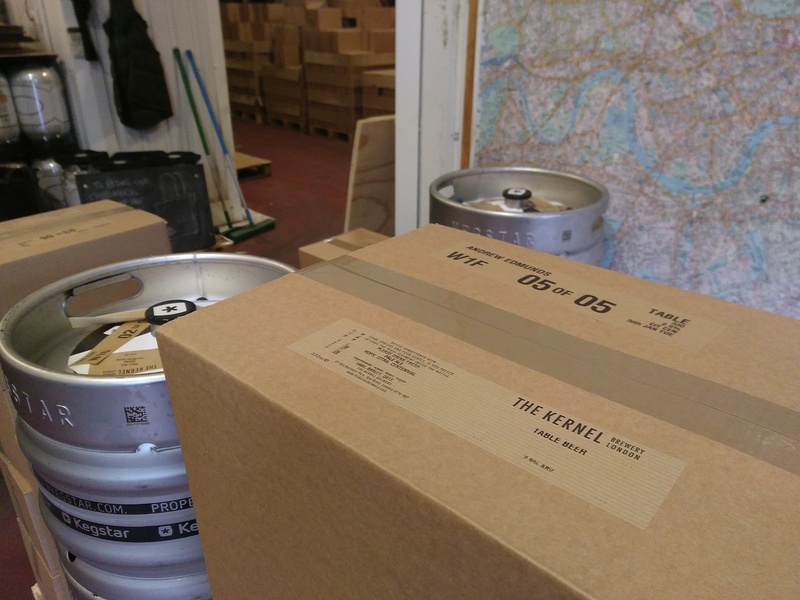 He started brewing at home, and after two years of experimenting and learning the ropes, he founded The Kernel, on a 600 litre kit on Druid Street. “The thing is”, he told me, “if I knew then, what I know now, I don’t think I could have done it, but there is a certain magic to that sort of cobbled together thing”. Just thinking in business in terms of something that can grow ad infinitum, just tends towards the concentration of money, power, capital, into a smaller and smaller number of hands. Even a small brewery being bought by a big one, being bought out by a bigger one, and then suddenly, you know, you have massive breweries like Heineken, or Carlsberg for example, owning a tiny brewery like London Fields, just around the corner. First of all, most of the big breweries are trying to get small breweries out of business. On a question of scale, in terms of that separation between the haves and have nots, if you can make something on a scale that works for everybody working in it… Everybody working here is looked after very well, and everybody’s happy to stay here. We’ve had one person leave in the last five years, you know, just growing slowly and slowly, but it’s a working environment that’s quite healthy. Breweries that get bigger then tend to have to start working shifts. So you have night shifts, early morning shifts. Like I said, we all start at the same time, finish at the same time, so you have that kind of thing of a common rhythm. It’s not compartmentalised. It’s not just a job, and it’s not just a shift. I mean, there are still ways around it, to make life interesting and work enjoyable even if you are shift brewing, but there’s different scales, so the scales of production, and human scales. We brew once a day, five days a week. It’s not a massive amount of production. It means we can focus our attention on the beer, that particular batch, properly. We all take turns brewing. So whoever is brewing, we each generally on average brew once every two weeks. Which means we’re not the most efficient brewers, because if you did everything every day you’d be a lot more efficient. However, Joby is brewing today, this is her first brew in two weeks. Everybody looks forward to their brew day. Everybody really enjoys it. Everybody wants to be that. It’s a bit disappointing if you don’t get to brew as often as you like, but when you do, you’re on it. I feel that that energy, that people carry towards what they do, is then focused into that day, because it’s their day to brew. Nobody has ideas that “this is my beer”. Because somebody else has looked after this cellaring, somebody else has looked after the yeast, somebody else has bottled it, somebody else is doing kegs, somebody else has sold it. We’ve all done everything for all the beers. It’s not as if it is your beer if you brewed it today. But you still have a little bit of ownership over it. Joby gets to choose the hops today, so she went, “Ah, these, never tried them before, what will they be like?” Already you’re not making beer towards a preconceived idea of what that beer is going to taste like. Yes, we have a pale ale that we make all the time. This will be another pale ale. But we want these hops to speak for themselves. We don’t want them to match up with a preconceived standard. It gives people a focus, to allow whatever they do to evolve and grow, rather than hit targets. That mindset is quite important because targets are limiting and they restrict what you can become. The other thing about scale is… I call it humanity, really that’s a bit excessive. But with 14 of us, we can all know each other really well, and trust each other. Like I said, we all take turns brewing. We all take turns bottling. We all take turns driving the forklift. We all take turns answering the telephone. Some people are not very good with the telephone. That’s okay. Some people have certain specialisations and certain experience which allows them to fit more comfortably into certain roles or have a certain expertise which allows them to help develop things, like people with certain brewing experience can help more, obviously, with certain technical aspects of brewing processes. But in general our system is relatively flat which means that the responsibility is shared between all of us. And you also have a lot more resilience in there in terms of if you lose someone, you don’t lose your brewer and you can’t brew. Or your phone, then no-one can answer the phone. You don’t have these linchpins that when you pull them out the system falls apart. And the responsibility is shared, so that obviously you don’t have a sales team shouting at a brewing team for not making the beer they needed to sell. Everybody understands what the other person is doing. So hopefully we all act in a way that allows things to function. How important is it being a London brewery that’s based in and really connected to London? That you’re not just exporting all over. You’re not doing a Brewdog, and exporting to China or whatever, but that you really belong here, in this place and of this place? Well there’s two or three things. The first one I mentioned to you earlier was about our immediate neighbourhood. So with my background in cheese, we moved down here six years ago with a community of like-minded businesses, friends most of us. Actually almost all of us used to work in Neal’s Yard. All of us did work at Borough Market. Moving down here to find space that we could rent collectively, and do things together. So we’ve got the Ham and Cheese Company there, that side is the charcuterie people. Then we’ve got the Little Bread Pedlar bakery. Then the other side we’ve got Mons cheese. We’ve got the Punterelle vegetable people. Greek people. Ice cream. Natural wine, natural wine, natural wine. Neal’s Yard Dairy. That’s our extended family. This morning the butchers have been in, the bread guys have been in – one looking for coffee, the other one looking for beer – and we’ve gone next door. We get a loaf of stout bread every Monday from the bakery. We just get croissants on Fridays. Our lunch involves cheese and bread from our neighbours. Your world is only as rich as the connections you make. With what you’re talking about in terms of Transition, there are various different levels of networks. We obviously have a direct connection with people that are next door. The people you see every day. It’s like your neighbours at home, when you need to borrow a cup of tea, or sugar, whatever, you just drop in, say hello, you know, that makes up the fabric of who you are. Same thing down here. I worked at Neal’s Yard Dairy since 1999, so I worked there for 10 years, and I had a cheese stall in the Borough Market. Now the same people, if not exactly the same, it’s the same family. We all share certain interests and we share certain goals and we care about the same things. It’s very helpful that we also share the same customers, quite often. So if somebody comes down to visit, say it’s a restaurant, we’ll take them next door to visit the ham guys or the cheese guys if they don’t know them, or vice versa. We share deliveries on occasions because we have vehicles going the same ways. We work with each other for events and things like that. But more than that, it’s our community. It helps that everybody’s pretty much amongst the best at what they do. So if you get cheese from Neal’s Yard, it’s the best British cheese you can get. Mons have the best French cheese that’s around. The bakeries, they have the best croissants and some of the best bread in the world. So you have someone next door who you respect, that you like working with, and we enjoy each other’s company. And every once in a while, once or twice a year, we’ll have a little neighbourhood party and those things are fun. But also on a bigger scale, there’s probably 11, 12 breweries in Bermondsey, which is its own issue, but that’s another community that we’re involved in. So whenever we need to borrow some yeast, or we run out of bottle caps, or whatever, we call Brew by Numbers or Partizan, because they’re our closest breweries on either side, and they’re our best friends. Partizan we’ve known since he was working at Redemption, so five, six years. We gave our old brewery to Partizan when he just started. I love what they do. I love the beer they make. They’re really cool people. One of the things you said in that ‘In Business’ programme actually was that the idea wasn’t to become the biggest and only brewery in London, but was to be part of, and support, an ecosystem of breweries all across the city. You said there’s 12 breweries in Bermondsey or something. Is there a stage when there’s too many breweries in London? In London, no. In Bermondsey, no. Having a lot of smallish things is healthier for an economy. Big companies tend to just siphon off money to shareholders. Anything spent in a small local business, money stays in that economy in numerous ways. It turns around. Most people are then more responsible, more accountable for their actions and tend to take greater care of their neighbours, their environment, etcetera. Even in a place that sometimes seems a bit cold, which London does. I like to think we’ve helped certain people with certain things, and other breweries. It’s great. London can handle a lot more. Also considering most breweries in London are still quite small. I suppose by now we’re not that close to being the biggest any more, but the vast majority, I’d say, 50, 60 out of a 100 are probably about 5 barrel systems or smaller. So a quarter of our size, and maybe producing less than that. So you can have a massive number of breweries, but if they’re all producing a small amount of beer, then it doesn’t really matter. It can be confusing for the customer, but that’s a different thing. That’s a different question. Oh, in terms of volume, no. In terms of market share. Oh, yeah, yeah. I mean, all of us London breweries together probably come up to maybe a 1% or something of beer that’s sold in London. I just made that up! I have no idea if that’s anywhere near accurate. Might be less. But then all the craft breweries together – probably excluding Brewdog – make up quite a bit less than Fullers make in a year. That’s not to disparage Fullers. I think they’re great. What they do is excellent. I have a lot of time for them. They have a lot of integrity. But compared to them, everything else is just tiny and insignificant. Their beer is quite a lot around London but it’s by no means ubiquitous or everywhere, as much as they might like it to be. The question of there being too many is less about too many, it’s more about how and where. And what are the circumstances that might cause that happen, or what happens if that does happen. So, for example, on Saturdays, you mentioned our taproom before that we closed down. The reason we closed down is because there suddenly opened up all these other breweries in Bermondsey, and it became a destination where people would come down and have a drink. That interfered with our relationship with our neighbours. It interfered with our ability to focus on what we thought was important. So if we were expending a lot of energy pouring beers, basically throwing out pints, managing a queue that’s 30 minutes long, managing a door, being a doorman, it’s taking a lot of energy that we thought was best used elsewhere. We were so busy and crowded we couldn’t give people the experience that we thought they deserved, that we thought our beer deserved, that we wanted. It became a place that we wouldn’t come and drink. It was too much. The railway arch itself is bare, empty. We would just repurpose part of the brewery to turn into a drinking hole, but it wasn’t ever made for that, so it was never comfortable. So that point of there being too many breweries on Saturday mornings, afternoons, in Bermondsey… Well, maybe it wasn’t too much, maybe it was a positive decision to close. But it did affect us. Sometimes you feel the hype overtakes things. It happens with beers themselves. It happens with limited releases. It happens with certain breweries. At 9 o’clock in the morning? Yeah. Well, we open at 9, so. It’s not their fault. Probably did quieten things down. Compared to brewing in the 70s and 80s, one of the things that I love about the whole craft beer thing is there’s a lot of space for imagination in it. In the 70s and 80s your success was on that you managed to make a beer that tasted exactly the same, wherever you drank it, wherever in the wold. And the craft beer thing brings together the design, and the flavours and the unusual ingredients. As a space – industry is the wrong word – what is it about it that has cultivated that space in which the more imaginative you are, the more successful you’re going to be? If you agree that that is the case. I don’t remember what I said in my email to you but I remember having a slight issue with the word – not an issue with the word imagination but a difficulty inserting ourselves into that conversation. It may not be the fault of the word. Not imagination per se, but, for example, the word ‘creativity’ is used so badly these days that I can’t use it any more. Same with ‘innovation’ in beer. Yes. So you understand what I think. Imagination, some people will use that in a similar way. So people will put whatever ridiculous ingredient in beer, and call it creative, or call it innovative. Or call it imaginative. I’m just waiting for my son to be old enough to read the Earthsea Trilogy. He’s not quite there yet, but I can’t remember. That’s good. No, I’m all for fighting for words. But maybe the thing is that I haven’t actually given imagination that much examination, if you know what I mean, in terms of trying to think of what imagination requires. I mean, maybe if I just rephrase it, a slightly bolder, emptier kind of statement from my side would be… I think I tried to allude to it earlier, that I’m not sure we brew with any imagination. That I think the resulting beer is not necessarily made to a mental template. It’s more of an assemblage, in this case of ingredients, with certain principles around how we do things, which allow things to go and express themselves. Your idea of imagination may vary. If you could explain yours at some point, that would actually also be helpful. We do a lot of things really regimentally, in a really purposeful fashion, but actually I don’t think brewing is necessarily about mastery or control. Some people’s version of imagination is the realisation of an idea. I don’t think we work that way. I think we try to make fertile grounds for things to then grow. So it’s more about evolution and actually coming and going beyond where we might expect something to be. So, for example, with us using a new hop variety. It’s not about it becoming a pale ale that tastes of a certain thing. It’s about what will this beer be? How can we best get these hops to express themselves? They might be completely not something we would enjoy. But at least if it expresses itself clearly then we can appreciate that. Then we may not use it anymore. Or it’s, “Well, that has certain characteristics. Yes, we will manipulate our recipe, but in order to get the best out of its expression. We try to allow it to dictate to us, the ingredients to dictate to us. The processes to dictate to us what needs to be done. We select certain things, according to certain criteria. I don’t know if imagination is the right word to describe that process, if you know what I mean. Yeah, I know what you mean. But at the same time, we don’t do anything off piste. We don’t add any flavourings to beers as far as we can… Well, okay, we added sour cherries to that one, that was quite obvious. I dislike assemblages of things that feel forced. Why I would put fruit in something and not herbs, spices, chocolate, vanilla, coffee…? In most of those cases we have done it before, and we’ve probably gone, “Yeah…” But then again, maybe that’s just a badly realised – you know, that doesn’t mean the idea is flawed. Maybe we just didn’t do it very well. But we haven’t put anything in beer, apart from fruit, for a very long time. And we don’t do anything really much outside of our core beers. The other thing is that for us they represent a certain honesty I suppose. That’s what we enjoy. It’s not to say that we wouldn’t enjoy a different style of beer, but it’s like, well if we want another saison, something different than we make, then we’ll go to Burning Sky and get a saison from there. If we want to have a cask ale bitter, we’ll go to Redemption and get one there. We’ll have a pint of Fullers. We don’t need to actually master all those styles. It’s actually probably quite difficult. But I think changing the hops, for example, each time we brew, does allow us not to fall into the rhythm of producing by rote. And also the fact that it’s a different brewer every day, so nobody has enough time actually even get into the rote. And it changes. I’d call it a certain openness. To me ‘what if’ calls for an answer. The imaginative bit would be to fill in that ‘what if’ space. If your thinking is like, “What if dah, dah, dah happened, then this might happen, or then that might happen, and that would be imaginative…” I would think that our process here is open in the ‘what if’ sense, but I don’t think if it necessarily allows the inhabitation of that space with the imagination, to a certain degree. So it’s not like if you look at someone like Cloudwater (in Manchester), where they don’t have core beers, it’s just different stuff coming out all the time. Yeah. They said that. They’ve changed a bit, but that’s fine. I mean they will evolve. I mean, we all will. I think they thought that, and then they had one style that just caught people’s imagination. And then nobody would shut up. They might not want to brew any more double IPAs, but the world is screaming at them for it. And they enjoy it, they like that. So I think they’re quite happy. It’s doing something for them. It’s what’s driving them to be who they are. Causing probably immense amounts of pain at the same time, but they’re difficult beers to make. I mean there are lots of breweries that specialise in things, like Buxton and Omnipollo. Have you come across them? Yeah, I went to the Omnipollo bar in Stockholm recently. Well there you go. I know them, I respect them. With the whippy head on the top. Yes, exactly. Or the chocolate sprinkles. Or beers with certain ingredients, or just this cross referencing between a dessert and a beer, or whatever. A style, a yoghurt, a Mr Whippy, a crème brûlée. Mango lassi. Exactly! And they do it with a joyous sense of humour. The way they look, the style, it works. I like the fact these things exist. It probably comes from a slightly more traditional idea of drinking. I don’t find most of those beers have drinkability. Most times, when ingredients are in beer, once the ingredient becomes perceptible, it tends to dominate. And once it becomes the dominant flavour, every sip gets harder and harder. Same with too much sweetness. Same with lots of things. Bitterness is the opposite. Things can be way too bitter but you actually keep drinking because the bitterness makes you thirsty so you drink more. But that’s another argument. I don’t think our beers are generally too bitter. But I sometimes struggle with the drinkability side of things. But then maybe I’m an alcoholic. Who are the people you look to and you go, “They’ve nailed it.” Your heroes? They’re probably quite obvious, but a lot of the Belgian tradition of lambic gueuze, spontaneous fermentation, those kind of inspired beers, like our sour cherry, have been adding things into beer for, in the case of Cantillion, for 100 whatever years, and that tradition goes back and back and back. Even if they do something new, it still tends to be very rooted in an old fashioned way of doing things. But the thing is, none of this adding of things into beer is really in any way new. I don’t think anybody in the last few hundred beers has come up with anything that hasn’t already been done before. I mean, Mr Whippy, perhaps. Marshmallows, exactly. There’s certain techniques that weren’t around. But you know, there was probably some cave man who froze some beer somewhere and it kind of came out pretty close but was unable to repeat the exercise! Most imagination is finding the right person to copy. But you could argue that most of the history of mankind has been a series of imitations. Often when you misinterpret something and come up with a brilliant idea, wrongly, it’s often that. That often seems the mechanism by which we evolve. It could also be to do with just getting old. Not old, old, but just, like I said, we put vanilla in something, we put coffee in something once, twice, vanilla once, cocoa, maybe once. Maybe we’ve done those things. Maybe 10 years ago I would have drunk a lot more double IPAs than I do now. Not because I don’t like them but a) they’re very strong and b) they’re really intense, and c) I’ve realised I’m looking for something more drinkable. It comes down to maybe just having learnt also a lot more about brewing, that you realise that a certain simplicity is something that I really appreciate. Clarity of flavours. You can get clarity of flavours in a big beer, but there’s usually a hell of a lot going on. So a simple cask beer like Redemption Trinity is only 3%, or like our Table Beer, or Taras Boulba from Belgium or just a saison that’s 4.5 or 5%. A really good Pilsner. You know, the cleanest and crispest. Maybe that makes me happier. That, actually rather than the new things being imaginative, I’m quite into the old fashioned things, but just a sign of something really well made. Someone who cares about what they do. Somebody who makes a beer with a lot of attention to detail, fastidiousness about producing something delicate. You said there’s already 12 breweries in Bermondsey, and you’ve talked before about this idea of an eco system of people brewing across the city. In your most delirious dreams – the happy ones – in 10, 15 years time, where could all of this get to? There’s not much space for happy dreams any more in this world. I’m not talking about the breweries in Bermondsey. Half of them I don’t necessarily know the people directly involved. But their brewing generally speaking, and probably anywhere, there’s a lot of people who are not necessarily in it for making good beer which just doesn’t really bode well. I don’t know. There’s perhaps a perception of that, I don’t know that’s necessarily the case, but there are people who are maybe building plans to sell them on. Looking for ways of making money out of things rather than paying attention to what’s the most important. If we maybe consider the Americans to be slightly ahead in terms of a growth curve … whenever I’ve been to New York I’ve stayed in Brooklyn, and basically every bar in Brooklyn will have Brooklyn Lager. Actually the ones who don’t have it will always have something better generally, so that would be your lowest common denominator. For you to start with that as the baseline, no matter where you are you could turn up and get a Brooklyn Lager, it’s not too bad. They’re not the smallest and the most independent thing anymore, but they’re still based in Brooklyn, and they make a beer that’s enjoyed by that neighbourhood. I don’t drink American beers over here very much. Why would I? But there, it makes perfect sense. It will come to the point where that will happen here. Be it somebody like Beavertown, or whoever, Fourpure, that will get to that scale, or maybe it will be better if there were a few. There already are people like Fullers in the meantime who have that covered. So soon hopefully we’ll get at least a decent London brew, pale ale, Pilsner, as a standard everywhere you went to. That’s still a long way off. So that’s all still to come. But on the rosier side of the picture, there may be places we can use as a model. It might not work in cities as big as London. But somewhere like Portland, Oregon, where they drink more craft beer than mass produced stuff, that’s a world worth fighting for. People have such a strong relationship with craft beer, and most of it is locally produced. They have almost as many breweries in Portland as they have beer in London, and it’s maybe a tenth of the size. I don’t know. Depends I suppose how you count it. That’s the positive future. Most of the breweries are quite small, in the neighbourhood bar. They have a taproom. They sell most of their stuff there.